This advanced block in Gamestar Mechanic, the transmogrifier, has the ability to shoot! Its maximum firing rate is extremely fast, and it can fire in any direction, including all four at once. However, its bullets have special properties: They hit and damage enemies rather than avatars, and when they frag an enemy, that enemy changes into another sprite of your choice with full health! The transmogrifier is quite versatile because it can turn its victims into dangerous enemies, helpful informers, stronger or weaker opponents, or even items that the avatar can collect. Check out this example of enemy-making transmogrifiers that turn a shooter game into an interesting exercise in population management: All enemies are running around in a circle, but the transmogrifier at each juncture changes them as they pass by. The player can change the cycle and edit the population of each enemy by touching or destroying the transmogrifiers. Set the bullet’s damage (which cannot be done with any other bullet). 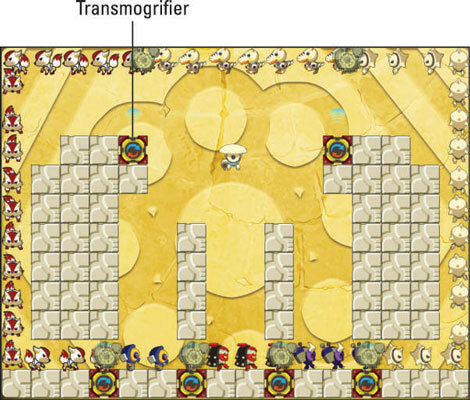 Pick the sprite in which to transmogrify targets. Edit the settings of the sprite. You can set the transmogrifier to create either an enemy or an item from its targets. If you want to edit the settings of the Transmogrify Into sprite, do not click Pick Sprite by mistake! You will have to readjust all of your sprite’s settings, which return to the default. The transmogrifier can also be affected by the avatar. It can be destroyed, and can even be toggled when the avatar bumps into it. By touching the transmogrifier, you make it turn transparent and inactive; move away and touch it again to reactivate it. If you want your transmogrifier to cleanly destroy an enemy without changing it, have the transmogrifier bullet turn the target into a Naviron grazer or Naviron gnasher (both of which have an energy meter) with Start Energy 1, Energy Usage 50 or more, and Damage 0.